It has come as no surprise that this year's coveted Nobel Prize for Flaps has been awarded to Mr Michael Leverage, the current director of lids and sundry coverings at JPL. 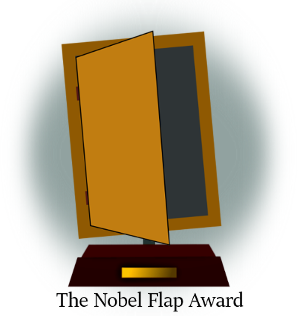 The Nobel Flap Award was initiated in 1901, since which time the Institute has done much to publicise the exciting and challenging work being done in the field of flap research and design. Previous winners have included Karl Spokken who devised the flap for the tape slot in the world's first home video recorder. And many people will also remember Brian Harris, whose precision engineering skills made the Pez dispenser a viable prospect. The contribution made by this year's winner follows in this fine tradition, and it is only right that Mr Leverage should get the recognition he deserves for his inspirational work in designing robotic flaps for the International Space Station.